AFTER the drama of being rescue today, Team Pure Gym will rejoin the race around Britain tomorrow morning (Friday). Three members of Pure Gym, skipper Claire Shouksmith, Ingrid Kvale and Steve Paterson, have been joined by Stuart Chamberlayne from Team Hallin, who were forced to quit the race after their boat suffered steering problems off Land’s End. 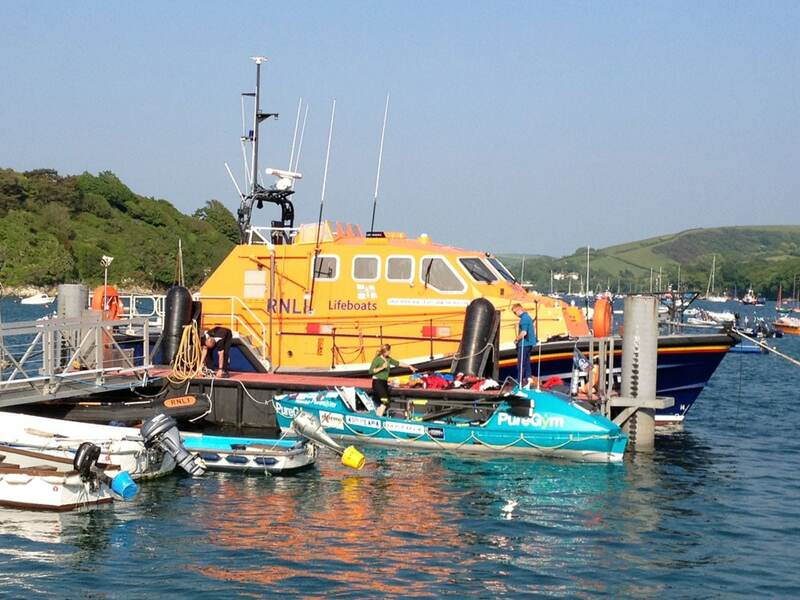 They all wanted to continue the dream to row 2,000 miles around Britain’s mainland, after being towed into port by the RNLI after their ocean-going boat suffered total electrical failure. Pure Gym will leave Salcombe tomorrow morning at 8am, and rejoin the race, heading for Land’s End. They will be joined by Josh Taylor and Jason McKinlay, now lying third in Savoir Faire, who are anchored off Salcombe tonight. As soon as Pure Gym arrived in Salcombe, the support team for Savoir Faire’s crew – Josh and Jason, who live in Salcombe, came to the aid of Pure Gym’s crew. Jason’s partner, Helen, provided shoes for Claire and Josh’s parents Nene and Paul provided accommodation for the stranded crew and organised drying of clothes.